To view information and images from past events, click on the links below. Thanks to all who came and bid at the Silent Auction for Charlesgate Alliance on January 27th. Here is an article about the event in the Improper Bostonian. Ron Mallis of Boston APP/Lab presented a design workshop to address questions of access when developing public spaces and public art. Using the emerging vision of Marie Law Adams and Dan Adams of Landing Studio and the universal design practices of Charles Baldwin at the Massachusetts Cultural Council, about 20 people participated in this experiential workshop on art, access, and design. 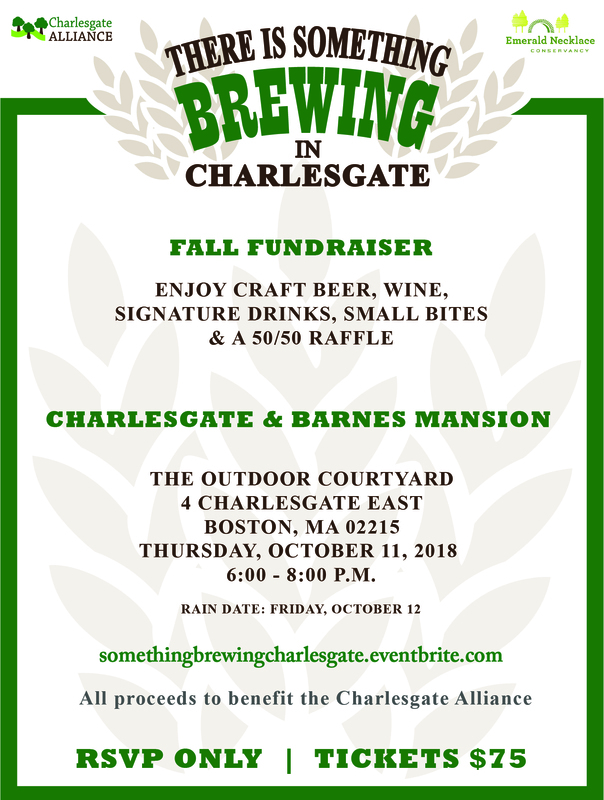 Roughly 90 people braved the rain for our evening fundraiser featuring craft beer, cocktails and food in the lobby of The Charlesgate. Thanks to Daria McLean Gibson Sotheby’s, Matthew S. Ginsburg, DMD, Charlesgate Realty Group, Columbus and Over Group, Sonsie, Cornish Pasty, Cornwall’s, Aeronaut Brewing, Hope Family Wines, Tito’s Handmade Vodka, Treehouse Brewery from Fenway Hazen, and Bakish Designs for their donations to this event. Here is the invitation to the event. We had a table in front of Patagonia (346 Newbury Street) with information about our project. It was enjoyable to meet people who were learning both about Charlesgate as well as the larger Emerald Necklace. We both walked around and talked about DCR Charlesgate with Marie Law Adams and Dan Adams of Landing Studio. We came together to celebrate the community-led concept design, and launch into next steps towards realizing the vision. Here is the flyer for the event. Thanks to the roughly 93 people who joined us for the Charlesgate Community Event of the Spring, Charlesgate in Bloom, a memorable evening in The Ayer Mansion, the only surviving residence created by American artist and designer, Louis Comfort Tiffany, at 395 Commonwealth Avenue. 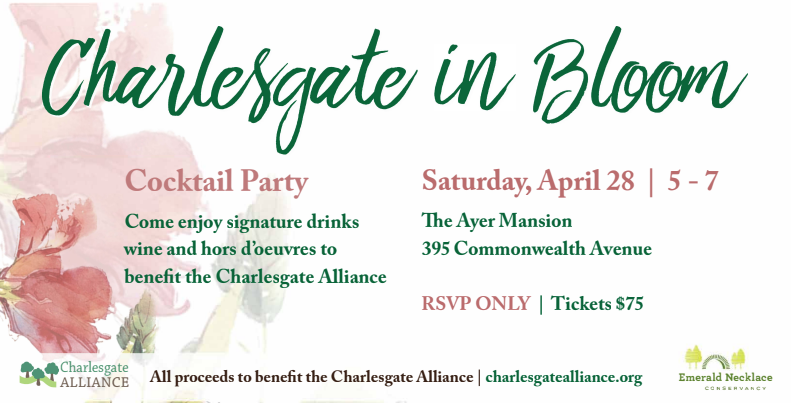 Charlesgate in Bloom was a fundraising event for the Charlesgate Alliance. Special thanks to Pawsh, Back Bay Florist, Deuxave, The Capital Grille, Sonsie, Wine Gallery, and Trill Foods. Here is an invitation for the event. This was our second year of participation in the Charlesgate area of the Muddy River Tributary region of the Charles River with the Emerald Necklace Conservancy and Charles River Watershed Association. Roughly 65 people came, including members of the Boston Seminole Club, MIT fraternity members from Phi Kappa Sigma, Delta Tau Delta, and Sigma Alpha Epsilon, Boston University’s Branch Out, the Boston Latin School Fishing Club, and members of the Charlesgate Alliance. Despite the chilly early April weather, we had a great turnout, led by Landing Studio, who have been honing ideas based on our first two meetings about the future possibilities for the Charlesgate area. They shared “existing” and “proposed” slides from the ground level, among other more developed ideas. The PDF flyer used for the event is here. Thanks to all who worked on this event, as organizers, contributors, and participants. The Charlesgate Alliance raised over $12,000. Marie Law Adams and Dan Adams from Landing Studio were on hand. Approximately 135 people attended. Will Brownsberger donated the Door Prize, a personal tour of the State House followed by lunch for six. Here is an invitation for the event. We had a wonderful turnout as Marie Law Adams and Dan Adams of Landing Studio again led us in a discussion of possibilities for improvement to DCR Charlesgate Park. See the event flyer for details. There was a slideshow at this event. Thanks to all who joined us as we discussed possibilities for improvement to DCR Charlesgate Park. The event began with historical background by Parker James and a welcome by Karen Mauney-Brodek, followed by a presentation by Marie Law Adams and Dan Adams of Landing Studio before we moved to smaller groups to discuss the park. Here is the event flyer. There was a slideshow at this event. It was great to see so many people turn out as we walked around DCR Charlesgate Park to survey current conditions and talk about possibilities to invigorate various areas. Starting location was in the area bounded by Charlesgate East and Beacon Street. See the event flyer for details. A special thanks to the members of Phi Kappa Sigma at MIT, who helped with park cleanup preparation and stayed around with us during the tour. Principals Marie Law Adams and Dan Adams of our newly named architectural firm, Landing Studio, were on hand. What a great day! Over 65 people showed up, including State Senator Will Brownsberger, State Representative Jay Livingstone, Ellen Arnstein from the Emerald Necklace Conservancy, a number of DCR people with trucks to cut up big branches and take trash away, Charlesgate Alliance members, as well as members of Greater Boston Kiwanis, MIT ROTC, and Grant Thornton. Thanks to all who helped! The area looks a thousand times better now!! The Boston Sun’s article on the event is available here. We celebrated the $400,000 funding which was recently approved by Mayor Walsh and voted on by the Boston City Council from Community Preservation Commission’s recommendation, and talked about how that, combined with $250,000 earlier released by the Commonwealth, will be used to develop a Charlesgate Park Revitalization Plan with a team of consultants. We celebrated the $250,000 funding which was recently released to the Emerald Necklace Conservancy for design and engineering improvements to Charlesgate Park, reviewed steps taken to professionalize the Alliance, got updates from existing committees and announced new ones, and ended with a presentation from Landing Studio. A slideshow was a major part of the meeting. We discussed the finances of the Alliance, our fundraiser last Thursday, status of our earmark, the completed CPA grant application, the end of the Charlesgate Chairs this season, and our relationship with the Emerald Necklace Conservancy. We discussed the status of an earmark that the Legislature approved, a CPA grant application, possible collaborations through Landing Studio, and upcoming events. We discussed progress with the Muddy Water Committee, the Events Committee, dog park research, a Safe Streets initiative, and ended with the current draft of a fundraising document created by Landing Studio. We discussed results from our recent events and planned for a Walk Around and Talk About Charlesgate on June 9th from 12-2pm. We discussed progress in Landing Studio’s design for Charlesgate, planning for our next public meeting, as well as a fundraiser on April 28th. We discussed results from our first Wine & Cheese & Silent Auction event, discussed ideas for a future fundraiser, and talked about progress with the project in general. We discussed results from our second “Talk About DCR Charlesgate Park” (December 4th), a grant for which we are hoping to apply at the end of January, and our upcoming silent auction (January 28th), among other matters. There was a slideshow at this event. We discussed results from our recent “Talk About DCR Charlesgate Park” (October 10th) and planned our next “Talk About” event on December 4th, among other matters. We discussed our upcoming “Talk About DCR Charlesgate Park” (October 10th, 7-9pm) with representatives from our new architectural firm, Landing Studio, and other matters. We discussed and finalized our decision to move ahead with an architectural firm to participate in the community process for improvements to the area. We also discussed final preparations for our upcoming “Walk around DCR Charlesgate Park” (September 16, 2-4pm). We discussed our request for proposals from architectural firms to participate in the community process for improvements to the park, finances, and our upcoming “Walk around DCR Charlesgate Park” (September 16th, 2-4pm).